Source Code is a film that manages to squeeze around 88 minutes of entertainment out of a sequence that lasts eight minutes. I say 88 rather than the film's running time of 93 minutes because its sloppy final five minutes constitutes a major misstep, but before it falls at the final hurdle, Source Code intrigues and grips more efficiently than most Hollywood thrillers manage to do these days. The setup is clever and a little complicated, but screenwriter Ben Ripley and director Duncan Jones ease us into the action skilfully, disorientating us at first before laying out the complexities of the plot in a way that rapidly draws us into the drama. We can forgive the late lapse in the face of such sharp, enjoyable filmmaking. 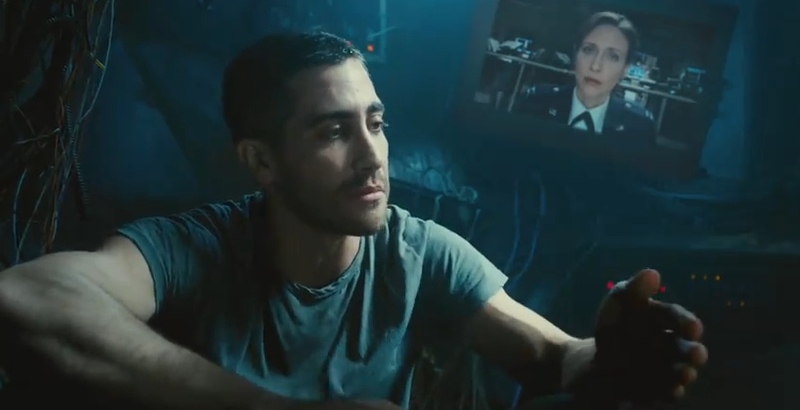 Source Code opens on a train with a man named Colter Stevens (Jake Gyllenhaal) wondering how he got there. The woman sitting opposite him (Michelle Monaghan) seems to know him, but she's addressing him by a different name, and when he stumbles into the toilet and glances at a mirror he sees a different man's face. Moments later the train blows up, bringing the curtain down on an arresting opening sequence. The truth is that Colter is a soldier plugged into a simulation/recreation of a terrorist attack that took place earlier that morning. The US military has designed a programme that can transport someone into the last eight minutes of a person's life, and they need Colter to use that limited time to find out what the bomber's next target is, sending him right back again every time he fails to do so. As in his debut film Moon, Duncan Jones has a knack for making the most of his confined surroundings, and I was impressed with the way he made each trip back into the train feel fresh and exciting, while Ripley's multi-faceted script is something of a marvel. He finds neat ways to slip important nuggets of information into the picture, developing both Colter's train-based mission and his slowly dawning realisation of his situation in the real world, without disrupting the narrative's flow. He also manages to work a little emotional resonance into a film that barely seems to have room for it, with great credit for that also going to the actors. Gyllenhaal is a superb lead, sympathetic and versatile, and he shares a genuine spark with Monaghan, who works wonders with a character that essentially only exists for eight minutes at a time. In a crucial supporting role, Vera Farmiga brings a nurturing sensitivity to her character and makes the expositional nature of the role work smoothly, but the disappointment among the cast – surprisingly – is the usually excellent Jeffrey Wright. I'm not sure what exactly he thought he was doing as Machiavellian scientist Dr Rutledge, but he's certainly serving up a slice of prime ham with his hobbling gait and weirdly mannered speech patterns. It's a rare false note in a film that generally hits the spot, driving forward with a sense of confidence and purpose, and stimulating the brain as well as the nerves. Jones has negotiated that difficult second picture with an ease that suggests he is a natural-born genre filmmaker, even if he does on this occasion blow a perfect ending.